Captain Moses Bradstreet was born about 1636 in Ipswich, (now Rowley), Essex County, Massachusetts. His parents were Humphrey and Bridget Bradstreet. In 1666 he inherited from his mother his father’s farm, a barn, a musket a chest and chair, a kettle, a Bern vessell, two kelers, and a churn. His first wife was Elizabeth Harris. They married on March 11, 1661/62 in Rowley. Elizabeth was born November 14, 1644. Her parents were John Harris and Bridget Angier. Elizabeth died about 1682. She probably died in childbirth. He his second wife was Sarah Platts Prime. She was the daughter of Samuel and Sarah Platts and her first husband was Samuel Prime. Sarah was born August 16, 1654 in Rowley. 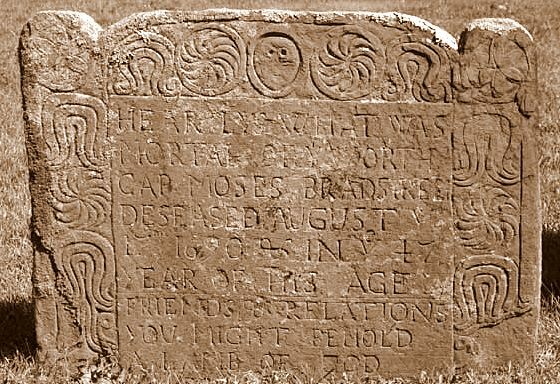 Moses died on August 17, 1690 in Rowley, Essex County, Massachusetts. 47th YEAR OF HIS AGE. Born: Rowley August 14th 1649. Died: Rowley March 18th 1683-84; buried there. Will: intestate; Sarah his widow and Abel Platts were appointed administrators April 15th 1684; they died and were replaced March 31st 1695-96 by Samuel Platts, the estate was finally wound up with that of Mark Prime March 8th 1696-97. Married: January 1st 1673-74 Sarah daughter of Samuel Platts and of Sarah his wife; born Rowley October 16th 1654; her second husband was Capt. Moses Bradstreet of Ipswich, Mass. ; died before 1696. 2. Sarah Prime, born May 8th 1678; married June 25th 1733 James Stewart; died December 29th 1747. 3. Mark Prime, baptized March 13th 1680-81; founder of the family still settled at Rowley. 4. Anne Prime, born June 27th 1683; joined the church September 12th 1714, at that time unmarried. Born: Rowley December 29th 1675. Will: intestate; Sarah his widow, later the wife of Robert Rogers having died, Moses Bradstreet was on the 10th of February 1722-23 appointed guardian of the surviving children: Samuel Prime aged over 14, Joshua Prime aged under 14, Sarah Prime aged under 14; final settlement of the estate February 12th 1722-23. Married: (published March 23d 1705-06) Sarah daughter of Joseph Jewett: and of Ruth Wood his wife; born February 3d 1689-90; married again October 7th 1718 to Robert Rogers; died November 20th 1722. 1. An infant died January 14th 1706-07. 3. Mark Prime, born July 30th, 1710; died April 1717. (church register said "A hopefull child." 4. Joshua Prime, of whom later. 5. 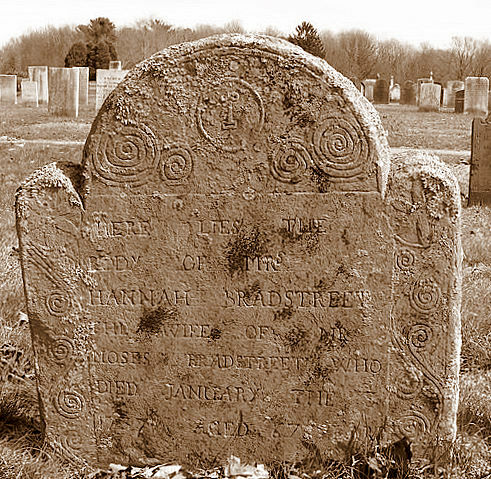 Sarah Prime, baptized February 5th 1715-16; married December 19th 1732 Josiah White of Wenham, Mass. 6. Mark Prime, posthumous; baptized March 23d 1717-18; died August 13th 1719. In 1708 he had permission given to him to erect for himself a pew in the meeting house at Rowley in the north corner in the gallery, and also one for his wife in the easterly corner of the gallery; besides the minister's pew, these were the first built. (II) Captain Moses, youngest child of Humphrey and Bridget Bradstreet, was born in 1643. He was a man of substance and influence, and was a captain of the military company. His will, dated August 16, 1690, proved September 30, 1690, mentions a ship, his home farm, lands in Haverhill and other property of his. The children of Moses Bradstreet were: John, Moses, Elizabeth, Humphrey, Nathaniel, Hannah, Samuel (died young), Bridget, Aaron, Samuel (died young) and Jonathan.